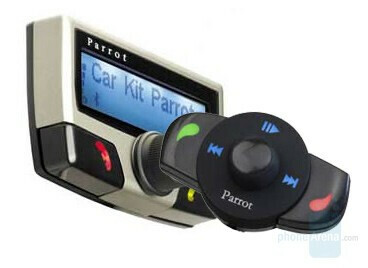 We just received information on Parrot’s latest advanced Bluetooth car-kit that’s dedicated to hands-free talking. 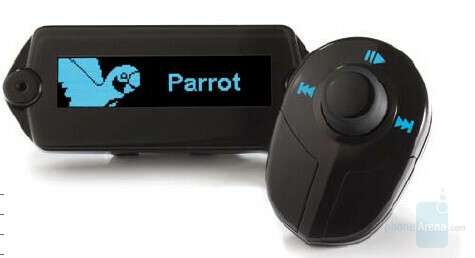 Parrot is French manufacturer, known for its excellent Bluetooth phone accessories for in-car use. The MK6100 can be considered as the successor of the both MK6000 (the Parrot’s first A2DP Stereo Bluetooth kit) and the CK3100, which is their most popular and best-selling model. The new 6100 combines the small and convenient OLED display from the 3100 with the A2DP support and the music-control pad from the 6000 to make a device that’s good for music as much as for talking. The two parts (display and music-control) are separate modules and the display is even detachable from its support, for security purposes when you leave the car. The MK6100 offers DSP (Digital Signal Processing) and features dual microphones (Parrot Beamforcing technology) for stronger performance. Once it is paired with your phone, the device automatically synchronizes the names from your phonebook and so you can dial one from it. 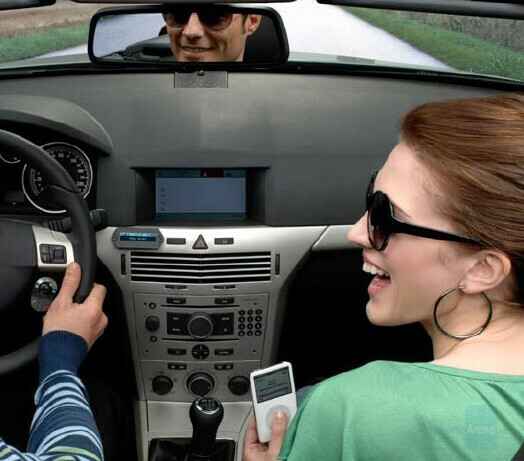 In order to keep your eyes on the road, Text To Speech system will Read the names of the contacts for you. In addition, voice dialing is also supported. According to Parrot, the MK6100 will be available in the second quarter of the year. I installed the MK6100 in my Ford Explorer. After spending an additional $60 for a wiring harness to make it compatible with my radio, it installed easily. Now the rest of the story. The wireless remote control only works occasionally. If it is not working, you will not be able to make a call. A new battery does not solve the problem. The mic is in the display. That mic is pretty much useless as you won't be heard even when shouting. They know that it is a problem because the kit comes with a separate mic that can be installed closer to your mouth. I installed it on the sun visor so that it is within 6 inches of my mouth. I still get complaints that the other party can't hear me. Talking loudly doesn't seem to help. If you have an iPhone there are additional problems. First, the firmware must be downgraded to an earlier version to be compatible with the phone. In that downgrade you lose some of the functionality of the system. If the remote happens to be working and you touch the green "answer" button, the MK6100 will dial the last number that you called on the phone. If that is not what you intended to do, you cannot stop the call with the MK6100. You must stop the call with the phone itself. Since the remote is attached to the steering wheel, I occasionally touch it. I have had to make several apologies. I consider this unit a waste of money. I will remove it from my car and search for something that is usable.